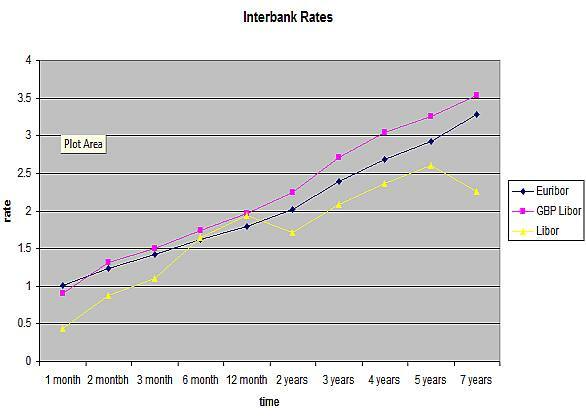 The graph below shows that despite different base rates in the US, UK, and Europe that our general interbank lending rates are correlated. One of the issues the US has been struggling with is to get their long term rates down and you can see in the 5-7 year money range (I don’t have the 10yr TNote figures to hand), the idea is to get lending kick-started again, credit flowing is healthy, just not at the bubble levels. The 5yr figure is significant for personal lending and financing away from credit cards via personal facilities. On the GBP Libor and Euribor the two yield curves are roughly matched so despite the UK having a base rate which is a full 75bips less than the ECB base they are still trading at higher margins. This is down to historic money pricing in the UK and it shows that Europe is truly pursuing a ‘middle of the road’ approach to rates, while the media focus is purely on the base rate the story is played out on the interbank market and we can see from the chart above that for the most part Euribor is charting right through the centre.